My aunt and I had discussed how we would go about the burial of my Uncle Grant. He was diagnosed with terminal cancer a few weeks ago and the doctors told us to start making arrangements. He expressed that he wanted to be cremated and so out search began for an urn after his death. What we first had in mind was a simple vase, but given the fact that he once served in the army, we found the burial display case to be more fitting. When it arrived, my aunt and I conceded that the case was even fitting for a President. Thanks for a wonderful burial urn. I bought this case about three years ago. Since it’s wall mountable, I find it easy to move whenever I change my décor. Love the versatility! I am overly sentimental, so I place it right before my rocking chair. It holds the precious ashes of my late husband, a former veteran. I bought the burial display case along with a stand for boasting all the awards that were accumulated by my cousin. I love the flag at the front that symbolizes why he lived and how he fought for this country. I appreciate that you have taken the time to create a product that commemorates those who sacrificed their lives for our freedom. The walnut finish of your beautiful burial display case blends in seamlessly with my living room furniture. I love its richness, sturdiness and stately presence in my home. It reminds me of the strong character of Jimmy, my husband. My grandfather was honorably discharged from The United States Military. After his death, we wanted to follow tradition, by folding the flag in a triangular shape as a symbol of honor. Thank you for the dual function of the burial display case. It was hard enough to choose an urn, so the inclusion of the flag came as one less worry in a difficult time. I like that I never had to order a flag separately for honoring a friend. 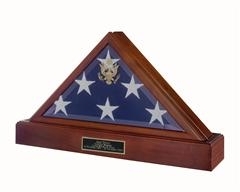 Your burial flag display case is a very innovative product and well-suited for a dignitary!